Spiegel & Grau, 9780385523202, 368pp. 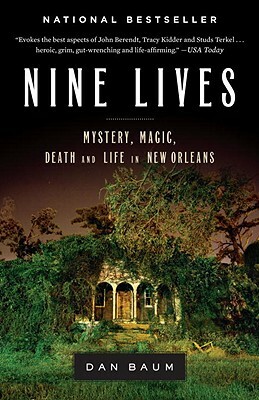 Nines Lives is a multivoiced biography of a dazzling, surreal, and imperiled city, told through the lives of nine unforgettable characters and bracketed by two epic storms: Hurricane Betsy, which transformed New Orleans in the 1960s, and Hurricane Katrina, which nearly destroyed it. Dan Baum brings this kaleidoscopic portrait to life, showing us what was lost in the storm and what remains to be saved. Dan Baum is a former staff writer for The New Yorker, and has written for numerous other magazines and newspapers. He lives in Boulder, Colorado.